Q: Can I make dhtml menu sample so a user can open a link on a Deluxe-Menu in a new browser tab instead of a new window using IE? I really like your menu system. Please could you tell us how to correct this. 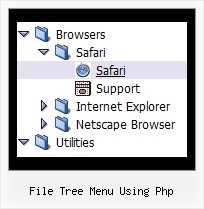 A: See, transitional effects (shadow) are features of Internet Explorer 5.5+ only. Also, this one from OpenCube (exploding submenus) runs on Firefox too. No way to get that in yours? Press Ctrl+F2 to enter/switch to next menu on the page. 0 - disabled (default), 1 - enabled. var dm_focus = 1; Show focus selection for selected item. var dm_actKey = 113; Key code for keystrokes activation. Works with Ctrl key only. Default value is 113 = F2 key, 114 = F3 key, 115 = F4 key, etc. Right now the text is so small that they actually look a little blurry. The only font I can increase is the font on the dropdown menus. but I cant change the font that appear on the actual tabs. If I could increase the font on them that would be great. A: You should change font in Individual styles.